Welcome to the crafting tutorial. In this tutorial we will be praparing Ganja and learning how the crafting system works on the way. The only ingredients which we will need are hemp plants. We will need a minimum of 6 of those but it is good to have more in case we fail during any of the stages of the crafting process, which is very likely to happen. Read the gathering guide to find out how to find hemp plants or buy them from other players. The best place to do crafting is Babylon since it has got all the terminals we will be using. All raw materials found in Project Ion can be refined using the Alchemy Terminal. Using Alchemy Terminal does not depends on any skills and does not give any skills. Alchemy terminal just like any other terminal in Project Ion can be activated by approaching it and right-clicking on it. 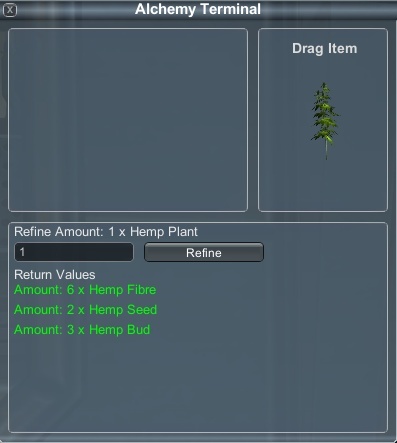 In order to refine the hemp plants drop them into the Alchemy Terminal window, enter the number of plants you wish to refine and click the Refine button. 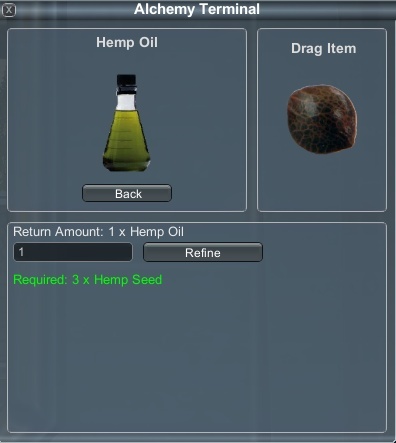 After a few seconds a loot window containing hemp seeds, hemp fibres and hemp buds should appear. Some refined materials can be processed further using the Alchemy Terminal. Open you inventory and go to ref materials tab. Drag the hemp seeds into the Alchemy Terminal window. You can now turn them into hemp oil. Hemp oil has a variety of uses in Project Ion crafting. If you drag it into the Component Terminal window, you should see available paint receipes. For now lets get back to the alchemy terminal where hemp oil together with hemp fibres can be turned into bio plastic. In order to prepare Ganja we will need 20 empty bags, 20 smoking papers and 12 hemp buds. You should already have hemp buds so lets move to the Component Terminal to manufacture the ramaining components. 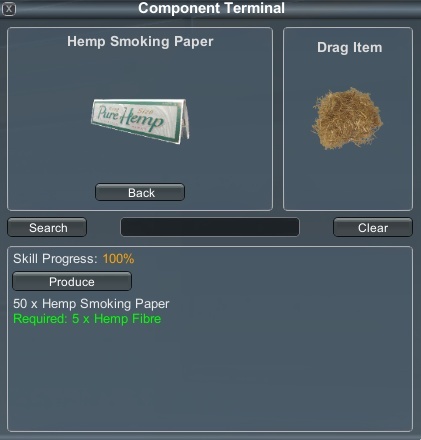 Drag the hemp fibres into the Component Terminal window to see the smoking paper recipe. Using this terminal gives crafting skills depending on the selected recipe. If a recipe uses organic materials like hemp fibres it should give Organics skill. Success rate of crafting using organic materials depends on the same skill. We should only be missing one component of our final craft so drag the bio plastic into the Component Terminal window to manufacture some empty bags. 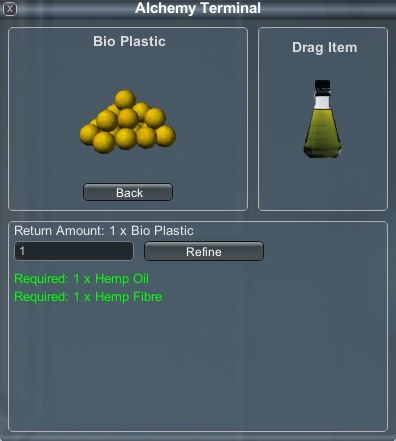 If any of your crafting at the Component Terminal fails, you might have to get back to the Alchemy Terminal to get some more refined materials and eventually even get more hemp plants. With all components in your inventory you can finally move to the Assembly Terminal where items are created. 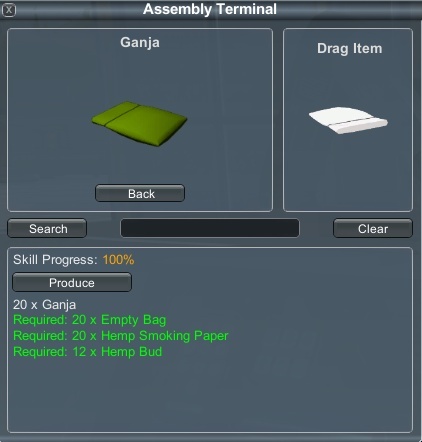 Drag empty bags or smoking paper or hemp buds into the Assembly Terminal window and select the ganja recipe. If any component is missing from your inventory or you haven't got the required amount, its name will be displayed in red. Press the Produce button and hope for a success! Ganja is a vey useful Health booster so keep it for your next hunting trip.